Portable chairs and tables are necessary to have on hand. 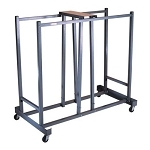 If you have lots of Lifetime Tables and Chairs, we highly recommend that you invest in a Lifetime chair cart and table cart to provide safe and easy transport, as well as a convenient storage, for your tables and chairs. 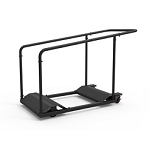 Lifetime dollies, carts, and trucks are made with the best materials in order to help them last as long as your tables as well as chairs will. 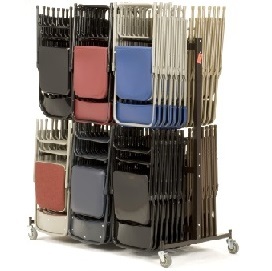 Lifetime Table and Chair Carts at low prices as well as volume discount rates. Free delivery on large orders from Competitive Edge Products, Inc.
You've got the chairs, we've got a way to transport and store them. 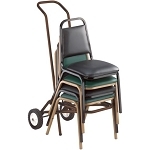 The Lifetime brand table and chair carts have evolved throughout the years. They feature large, non-marring casters. Two casters swivel and two are fixed to allow for easy maneuvering when storing in closets and tight spaces. The heavy-duty metal is powder-coated to prevent rust and the size of the cats are designed to fit through standard single doorways with the exceptions of the two-tier hanging chair cart. The best seller is the 6525 for chair carts, but the newer design that includes specific maneuvering handles is gaining traction 80525. There is also a home-use Lifetime chair cart 80279 which holds about 8 chairs conveniently. There are wall-mount hanging chair racks designed for garages or walls. 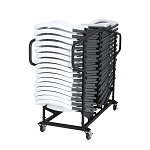 Although Lifetime Products, Inc manufactures chair and table carts customers will often purchase a different brand for their Lifetime chairs and tables including NPS National Public Seating, Correll Inc, Rock N Roller, and others. There are many types of carts. Some allow for storage under stages, some are chair dollies that are designed for transporting, but not necessarily storing. 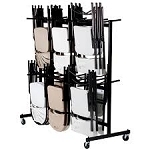 Our best selling table rack is the Lifetime 80339 which holds both rectangular and round plastic tables of any brand. 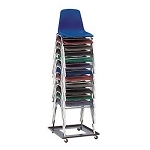 The upgrade and newer design is model 80193 that has slots to hold the tables in place.